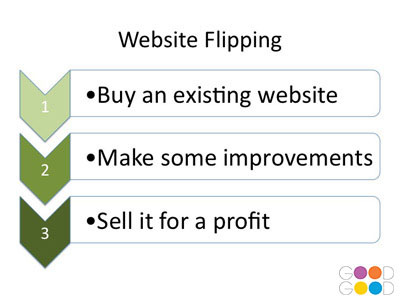 Website Flipping is the process of buying a website, improving it and selling it for a profit. It doesn’t get any more complex than this. This term “Flipping” comes from the real estate industry where the purchase of a property is made, improvements are made and then resold. The same process can happen in the digital / web sphere, where it’s done with a website, except you are flipping a website not a house. Done correctly Website Flipping may be very profitable and some people make it their business to do this. Set up some products to sell ie. Click Bank or e-Junkie etc. So in short, you are adding value back into the site. You can take as long as you like, or spend a week on it and push it back out there to be sold again quickly – who knows maybe it’s a hot topic website ie when a new product is released.